Difficulty in reading print or written text Your vision isn't as sharp as it used to be, making it seem less defined It becomes more difficult to discriminate between colours. 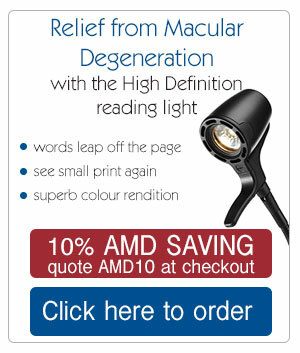 Most importantly you need a brighter light when reading or carrying out specific tasks. 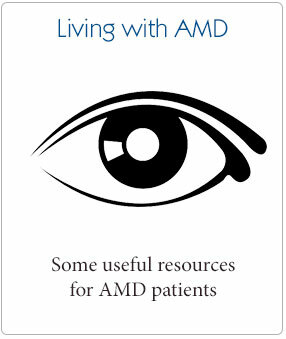 We find that we are able to help AMD sufferers find a light that helps them make the most of the vision that they have. By using exclusive Daylight Wavelength Technology™ in our High Definition Light range it can offer exceptional colour rendering. 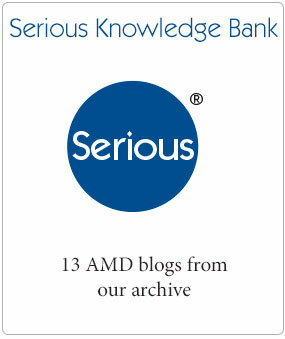 Here at Serious Readers we understand that there is no light that fits all, so we have included a dimmer function that can be used to adjust the lighting levels to find your own level of comfort. If our lights cannot help you, we are always happy for you to return the light to us and we will give you a full refund (including postage). All of our customers are entitled to a 30 Day RISK-FREE trial so why not try it in your favourite reading space and see for yourself the remarkable difference it will make? 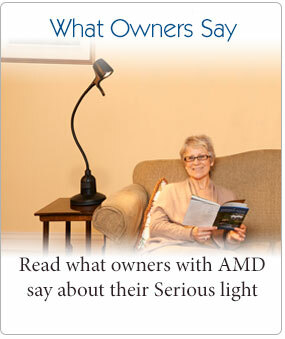 Some of our customers with AMD found that they were able to do things again that they weren’t able to since developing AMD such as reading the newspaper and returning to their hobbies that they sadly had to give up in the past. We are not offering a cure, but helping you take a small step back into the lifestyle you used to lead when your eyes were at their pinnacle. Click here to see what happy owners say.